World Wildlife Fund and plant-based food and drink producer Alpro published a report on how companies can reduce their environmental footprints. They go beyond general sustainability principles and address more sustainability issues than climate change. Alpro researches how they perform on science-based targets for land, water, nutrients, and biodiversity that respect planetary boundaries, and how they can improve on them. This kind of research is new: it existed on the planetary level, but not yet on the level of individual firms. It was done by a team of scientists led by Amsterdam-based consultancy company Metabolic. 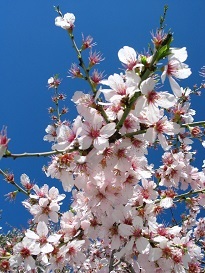 Almond blossom Photo: Wikimedia Commons. Alpro is a European company, part of Danone, and describes itself as the pioneer of plant-based food. They sell plant-based drinks, alternatives to dairy products, made from non-GM soya, almonds, hazelnuts, cashew, rice, oats or coconut, under the names of Alpro and Provamel. The project sought to develop methodologies for measuring the company’s footprint, and also provided recommendations based on Alpro’s particular circumstances. For whereas the researchers’ methods may be applicable across a broad field, the environmental variables researched are area specific; and therefore the recommendations may vary greatly among companies. In terms of biodiversity for instance, the report recommends to create corridors of biodiversity on Alpro’s farms in order to increase connectivity with surrounding natural habitats. And in terms of water, the report highlighted the already precarious water supply at some of Alpro’s farms. I had the opportunity to ask Brian Shaw of Metabolic, one of the co-authors of the report, a few questions. Is this the first inquiry into broader corporate sustainability (i.e. addressing more than climate change)? In what respects is it a step forward compared to its predecessors? 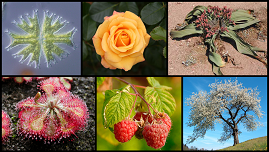 Vegetal biodiversity. Photo: Rkitko/Abraham, Wikimedia Commons. Do you take into account that boundaries are flexible and may shift because of technological change? The report concludes that understanding trade-offs between boundaries is crucial. Performance in one area is bound to be linked to impacts on other boundaries. For example, Alpro’s organic farms performed better than its conventional farms on water efficiency, soil nutrient loss, and carbon emissions. However, the organic farms produced less yield per hectare of land used, so the report explored what trade-offs they could make to increase this. For instance: increasing irrigation, or alternative fertiliser use on organic farms, safe within the limits for water or soil nutrient impact. The authors hope that reports like this one help companies to ‘budget’ for other environmental impacts in the same detail as many already do for carbon emissions. to create a healthy, clean and #sustainable #environment for our present and future.